seca added value: A wireless stadiometer that can send its measurements to a PC? There is such a thing – from seca of course: the digital stadiometer seca 274 (free-standing) and seca 264 (for wall mounting). Both transmit the measured height with the help of the newest seca 360° wireless technology to your PC, where the data are analyzed by the software seca analytics 105. From there they can also be transmitted to an Electronic Medical Record (EMR) system. The stable glass platform of the seca 274 with integrated heel positioner guarantees precise measurement results and a secure foothold. 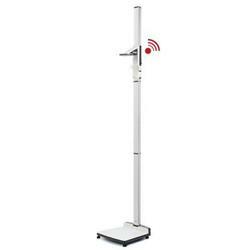 If you are looking for a wireless solution for taking height measurements, you cannot go wrong with the free-standing digital stadiometer seca 274. Its individual parts of high-quality aluminum can be easily assembled and tightly screwed together and its measurement range from 30 cm to 220 cm can be used for small children to adults. Additional benefits include the stable glass platform, the white backlit display on the headpiece and wireless data transmission. 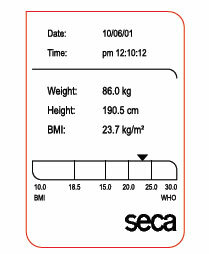 Data can be sent to a seca 360° wireless printer, a PC or a wireless scale that can calculate the BMI from height and weight measurements.